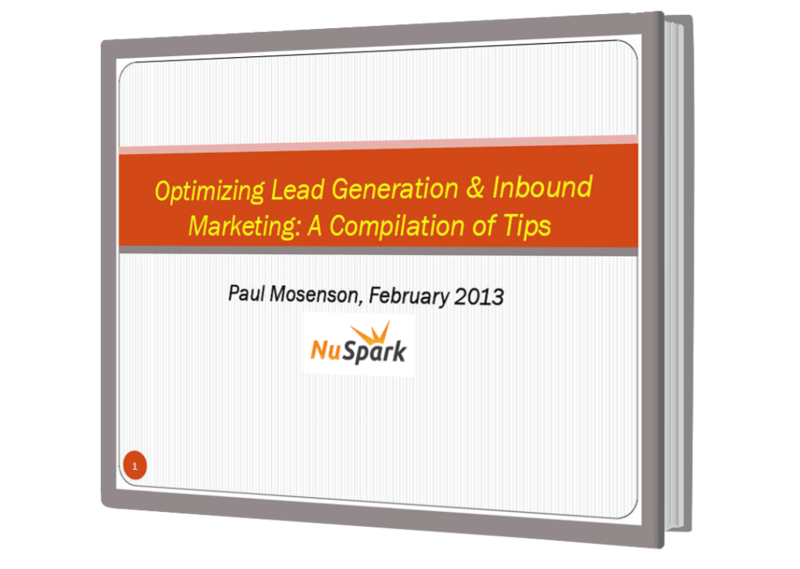 This is the ultimate guide to generating leads and optimizing inbound marketing tactics. You get over 100 pages of best practices, tips, and tools that contribute to an optimized internet marketing strategy. Author and NuSpark Marketing founder Paul Mosenson is a nationally renown digital marketing and media strategist, with over 25 years of optimization success. After downloading and reading the eBook, you’ll have a better understanding on the multi-faceted lead generation process, with tips that will optimize your internet marketing performance; meaning more leads and conversions. If you are not redirected to the ebook with 5 seconds after submitting your form, look for an email in your inbox with a link to the download. We respect your privacy. We do not sell or share your information with anyone else. As an advisory CMO, I have the opportunity to work with a wide variety of internal marketing teams and external marketing firms. From the start Paul and his NuSpark Marketing team have impressed me with their ability to quickly become a team players and a strategic partner vs. just another vendor. They are currently leading a demand generation program for an IT client of mine targeting Enterprise and have shown an ongoing ability to present new lead generation tactics that can be measured with analytic dashboards. Paul and his team go the extra mile, think proactively and are a pleasure to work with. If you’re looking for outstanding 24/7 service I would recommend Paul and the NuSpark team for any IT or B2B firm looking for quality lead growth. NuSpark facilitated all our needs in our initial foray into internet advertising. Paul surveyed potential outlets, helped us select the sites with the best demographics, established pricing, and organized the advertising copy. Additionally, his attention-to-detail with our pay-per-click campaigns has contributed to our conversion growth and increased ROI. Paul has also been responsive, thorough and informed. I would highly recommend him and his team for any b2b company looking to grow within interactive channels. NuSpark has been extremely valuable with helping us develop a comprehensive demand generation plan in the United States and Europe. Utilizing their full scope of inbound marketing and content development services, our lead generation goals were far exceeded. Paul and his team have provided exceptional service and are always coming up with new marketing ideas for us to implement. I would highly recommend Paul and his team to any firm looking to grow the number of quality leads in their funnel.